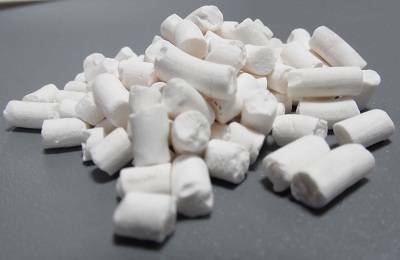 Industrial adsorbents, which separate gas mixtures well due to a well developed system of pores, include activated charcoals and clays, inorganic gels (such as silica gel or activated alumina), as well as crystalline aluminum silicates – zeolites – synthetic zeolites – molecular sieves. Activated charcoals, activated alumina and silica gel do not have ordered structure, and therefore the porosity is not uniform. Pore diameter distribution in adsorbent particles can be either narrow (from 20 to 50 A) or wide (from 20 to several thousand angstrom). Zeolites, on the other hand, have uniform pores (3 to 10 A), the size of which is defined unambiguously by the size of the crystal’s elementary cells. These pores cannot adsorb molecules larger than the pore diameter. The term “molecular sieve” was originally introduced by J. McBan, referring to adsorbents which can act as a sieve when separating various molecules. The term is also interchangeable with ‘synthetic zeolite’ – sorbent – adsorbent. At this time it is known that dehydrated zeolite crystals are have the best molecular sieve properties. Due to a system of channels or cavities, such adsorbents have a well developed internal surface accessible to the molecules being adsorbed. The external surface are of zeolite molecular sieves is, in fact, only a rather small fraction of their total surface area. Zeolites (molecular sieves) are somewhat selective as to different molecules, moreover, the molecular sieve action may vary. In case of a full molecular sieve effect, some molecules fully spread into the crustal, while other molecules do not. At present, zeolites (molecular sieves) are used not only in adsorbtion, but also in many other areas of chemistry, such as, for instance, in catalysis and ion exchange, however, they are still referred to as molecular sieves, although this term does not reflect other uses of zeolites and does not imply the well known ability of zeolites for sieve effects in catalytic and ion exchange reactions.